Those who attend the open house will tour the center and learn about the law school’s rigorous academic program and how the faculty works closely with students to develop a course of study that matches their goals. Prospective students are invited to attend an open house from 11 a.m. to 2 p.m. on Sunday, Nov. 12, at the Quinnipiac University School of Law Center, 370 Bassett Road. Those who attend the open house will tour the center and learn about the law school’s rigorous academic program and how the faculty works closely with students to develop a course of study that matches their goals. The law school has concentrations in several areas, including civil advocacy and dispute resolution, criminal law and advocacy, family law, health law, intellectual property, international law and policy, tax law and workplace law. “Quinnipiac University School of Law is a dynamic law school, small by design, dedicated to preparing highly trained lawyers who will hold themselves accountable as leaders and serve their clients with skill and compassion,” said Jennifer Gerarda Brown, dean of the law school. In addition, the law school offers several joint degrees, including the JD/MBA and JD/MBA in health care management with Quinnipiac’s School of Business, JD/Master of environmental law and policy in partnership with Vermont Law School, and the JD/MSW (master of social work) with the university’s School of Health Sciences. In addition, students can choose from a growing slate of international opportunities, including a legal summer study abroad program in Ireland. Quinnipiac’s clinical and externship programs immerse students in real-life work and environments that build highly skilled lawyers. 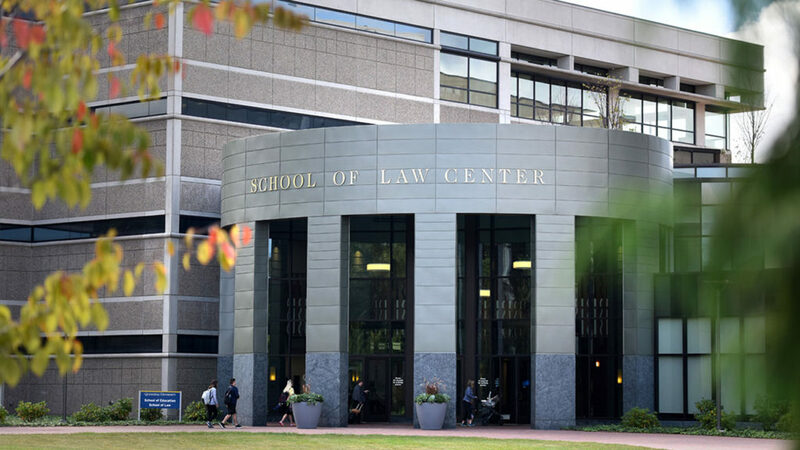 Because the state of Connecticut permits supervised law students to represent clients in their second year, the law school has been able to design programs that offer an extra year of hands-on experience compared to those in most other states. Every student is guaranteed participation in at least one of these practical learning opportunities, mastering theory along with crucial practice-ready skills. Over the last three years alone, students in the law school’s clinics have provided more than 31,000 hours of free legal services. Among the 20 clinic practice areas are criminal justice, health law, intellectual property, legislative and public interest. Quinnipiac’s externship program has more than 300-plus placement sites and is built on a model that emphasizes collaborative relationships among students, faculty supervisors and the lawyers, judges and mediators who serve as field supervisors for Quinnipiac externs. The law school offers externships in 15 categories, including family law and veterans’ advocacy. For more information, call 203-582-3400.